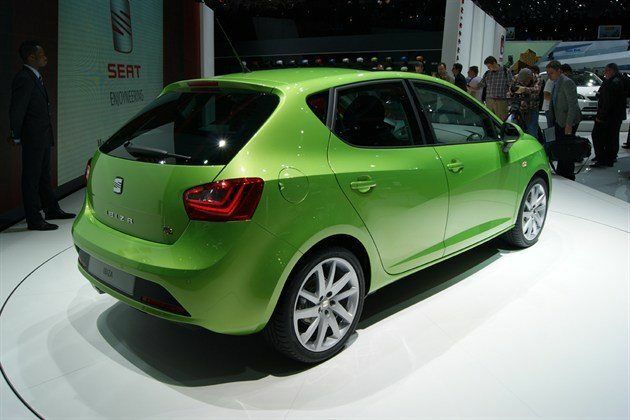 SEAT has unveiled the facelifted Ibiza at the 2012 Geneva Motor Show. It gets a new front end look, improvements to the interior quality and more economical engines. All three versions – the five-door hatchback, the three-door SC and the ST estate – get the updates with the new models going on sale in the UK in spring 2012. The styling changes aren’t huge but there are new bumpers, more angular headlights and a honeycombe grille. This new look will be seen on future SEAT models and is even more accentuated in the FR and Cupra versions. Inside the quality has been improved with redesigned climate control, a new instrument binnacle and a larger glovebox. The Ibiza is also available with SEAT’s new Portable Media System with a touchscreen display which includes a navigation system, an on-board computer and Bluetooth. It is fully integrated with the Ibiza’s electronics and is also removable for using on the move. The engine line up continues as before with petrols including a 1.2-litre TSI Ecomotive which is fitted with an engine start/stop system and can average a claimed 55.4mpg yet still has 105PS and 175Nm of torque. There is also the 1.4 TSI in the FR that’s fitted with both a supercharger and turbocharger giving it 150PS and a 0-62mph time of 7.8 seconds. This engine is now also available in the ST estate version, creating an Ibiza ST FR for the very first time. But for economy it’s the TDI diesels which lead the way. The 1.2 TDI E Ecomotive averages a claimed 83.1mpg and emits just 89g/km of CO2 meaning zero car tax.